In addition to the Canadian Cyclist Awards, the Canadian Cycling Association (CCA) and PacificSport gave out broad array of awards that recognized the incredible cycling talent Canada is home to. A press release and full list of awards is below. There is lots of team stuff happening, some of it official, some not quite yet. Chrissy Redden will be leaving Ritchey-Yahoo! (who are doing a Euro team only). She hasnÃ¢â‚¬Å¡t finalized her contract yet, but she will be moving to a big, blockbuster team - we should be able to say something next week. Chrissy also said that she will be doing the first ever womenÃ¢â‚¬Å¡s cyclo-cross World Championships next January (in Holland). She has to be considered a strong medal contender. We have already mentioned that Chris Sheppard and Seamus McGrath will be riding together for Haro Bikes in 2000. Both are excited about the team, which has signed clothing manufacturer Lee as a sponsor. Chris says that the extra funding will allow them to really concentrate on racing, and getting ready for the Olympics. McGrath is moving out to Victoria for the winter to train, with Sheppard spending part of his time in North Carolina. Chris has also promised to continue sending in Ã¢â‚¬Å¾The Shep ReportÃ¢â‚¬Â° while he is on the road. Chris Sheppard was surprised to win the CCA award for Male Mountain Bike Athlete, and immediately said that it should have gone to his new teammate Seamus. Pretty classy, but Chris, you have been one of the most consistent riders of the year, and lead the UCI menÃ¢â‚¬Å¡s rankings for North Americans. Brian Walton and Michael Barry will both stay with Saturn, as will Lyne Bessette and Clara Hughes. 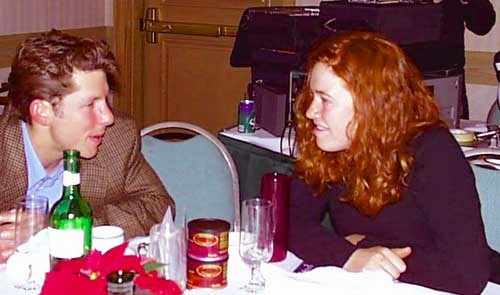 Clara sat with us at the banquet (as did Chrissy, Chris Sheppard and Daamiann). Clara had just left Calgary, where she spent some time speedskating. She says that she is definitely committed to her long range plans of trying for future Olympics in speedskating after Sydney. Clara also filled us in a little more on her crash prior to the Worlds Time Trial race. A few days before the race she and Linda Jackson were out training and a woman ran right into her, knocking her flying. During the race she was so sore and stiff that she couldnÃ¢â‚¬Å¡t even lift one of her arms to shoulder height. Despite this, she finished 7th. The representative from national team sponsor UPS was quite excited about his companyÃ¢â‚¬Å¡s involvement in cycling, and promises that this is a long-term commitment to the sport. He will be working with the national team to prepare for Sydney, and we should see some promo stuff on the sponsorship in the new year. 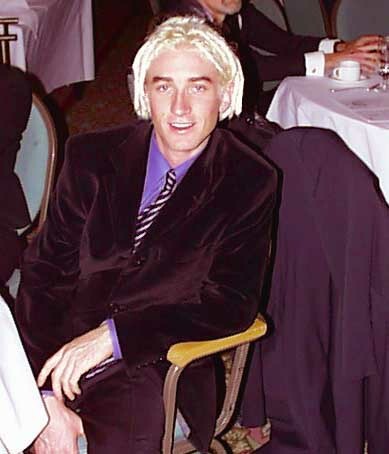 National Development Coach Jacques Landry joked that his title has been changed to Gopher. He is busy wrangling the riders through the various sponsor photo shoots that are probably the biggest part of theÃ¢â‚¬Â°training campÃ¢â‚¬Â° that accompanies the Gala. Dominique Perras, who recently signed a pro contract with a new (and still nameless) Euro squad, admitted that he is a little scared of making the jump to the pro ranks. He thinks that he will be making his debut with the team at the Malaysian Tour of Langkawi, at the end of January. The final figures arenÃ¢â‚¬Å¡t all in, but it looks like the Gala and Auctions raised approximately $12,000 for the PacificSport National Cycling Centre. Of that, about a third was raised through the online auction, and both the coaching staff and the athletes were very appreciative of the efforts and contributions of all the bidders. Thank you all for your contributions towards our cyclistsÃ¢â‚¬Å¡ preparations for the Sydney Olympics. Attention in Victoria now turns to the CCA AGM, which will be held Saturday afternoon (December 4th) at 2:00 pm in the Harbour Towers hotel. While individual members can not vote, it is your right to attend and see what is going on at the national level. Please make the time to drop in, if you are in the area. The most interesting election should be for President. Opposing incumbent Brian Jolly (who is running for a third consecutive term) is former Quebec federation president Michel DuPaul. We hear that the telephone lines have been burning up across the country as the Jolly and DuPaul forces marshal their votes. Also on the table is a considerable amount of restructuring (alluded to in earlier news items). Our snooping suggests that the proposed changes are not a Ã…â€™done dealÃ¢â‚¬Å¡, with some of the provinces uneasy about the consolidation of power being presented. We rate this one a 50-50 chance of passing unchanged. 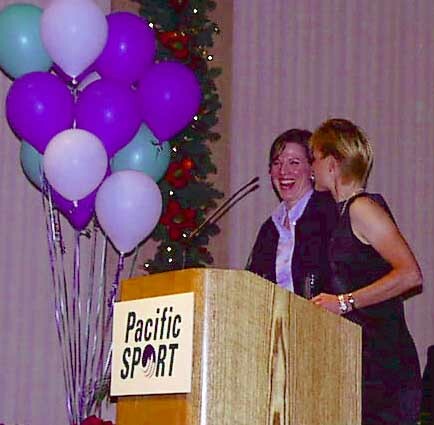 Victoria, BC, December 2, 1999 - CanadaÃ¢â‚¬Å¡s top road, mountain and track cyclists celebrated a stellar season with their teammates, coaches and supporters at the third annual PacificSport National Cycling Centre Champions of Cycling Awards Gala tonight. And a cyclist from each discipline was a double winner, taking home prestigious awards that revealed their talent on the international roads, trails and velodromes of the world. 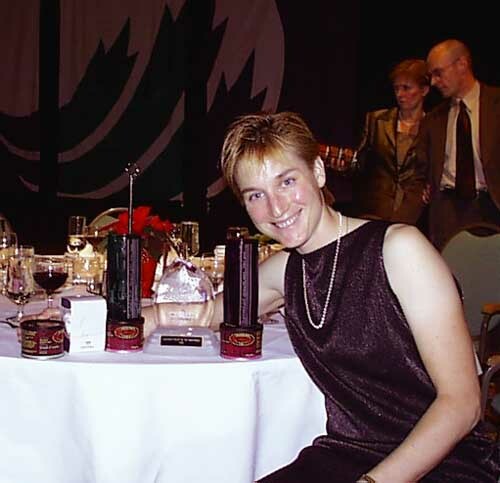 Alison Sydor, who captured her third World Cup title this year, received the Female Mountain Bike Athlete of the Year Award and shared the PresidentÃ¢â‚¬Å¡s Trophy with Tanya Dubnicoff, CanadaÃ¢â‚¬Å¡s top female track cyclist ever. Dubnicoff also received the Female Track Athlete of the Year Award, a recognition in part for her double gold performance at the Pan American Games held in her hometown of Winnipeg. The cyclists are in town for an annual two-week national team training camp under the direction of Canada1s top coaches, including Head Coach of the PacificSport National Cycling Centre Yury Kashirin. The camp provides an opportunity for all of the riders to train together, regardless of their discipline, as they prepare to qualify for the 2000 Sydney Olympic Games. The PacificSport National Cycling Centre is a partnership of the Canadian Cycling Association, Cycling BC, the Victoria International Bicycle Race Society, the Greater Victoria Velodrome Association and PacificSport. PacificSport lends its name to the new integrated network of multi-sport athlete training centres in British Columbia, the first of its kind in Canada. Through collaborative initiatives and unique partnerships, PacificSport is committed to creating a dynamic new environment for sport excellence in athlete services, world-class coaching and sport development at all levels. The PacificSport Group is comprised of multi-sport athlete training centres throughout BC, including the National Sport Centres in Greater Victoria and Greater Vancouver. Regional Sport Centres are located in Abbotsford, Kamloops, Nanaimo and Victoria, and Prince George, covering the Fraser Valley, interior, Vancouver Island, and the north respectively. RUSS COUPLAND AWARD - Best Overall Junior - Genevieve Jeanson, Lachine, Que. FEMALE ROAD ATHLETE OF THE YEAR - Lyne Bessette, Knowlton, Que. MALE TRACK ATHLETE OF THE YEAR - Doug Baron, Calgary, Alta. STEVE BAUER AWARD (Most promising female) - Genevieve Jeanson, Lachine, Que.